As a parish in the established Church of England, it is our privilege to be involved in many of the significant moments of people’s lives. We will do our best to guide you through what Christians mean by baptism, marriage and funerals. For enquiries about any of these services please contact the Parish Office, and the vicar will then contact you to discuss arrangements. The Bible teaches that baptism does not make us a Christian, only faith in Jesus can do that, but it is a wonderful introduction into the Church family. Baptism is the beginning of a journey of faith and it needs the help of parents, godparents and the rest of the church family. That is why we do baptisms as part of our normal Sunday services. The water of baptism is a symbol of the cleansing and forgiveness that all of us need and that only Jesus can provide. Jesus himself was baptised in the River Jordan, not because he too needed to be forgiven from sins, but to stand alongside us in solidarity and to set us an example to follow. At St. Lawrence we baptise both infants and adults, at a service which is often called a ‘Christening’. Infants require godparents, who, together with the parents, make promises on their behalf. Godparents must be baptised Christians. Adults make the promises themselves. If parents feel unable to make the promises required in the baptism service, we are very pleased to offer a service of thanksgiving and dedication instead. Marriage between a man and a woman is a great gift from God, where husband and wife give themselves completely to the other person. The Bible sees this profound bond as a picture of the relationship between Jesus Christ and His Church. We would be delighted to help you explore this act of commitment together on your special day. Because marriage is such a precious and special thing, we offer wedding preparation classes to help couples have a happy, life-long and fulfilling marriage. 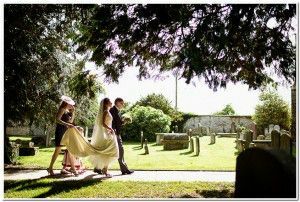 You do not need to be churchgoers to get married in St. Lawrence church. The gift of marriage brings husband and wife together in the delight and tenderness of sexual union and joyful commitment to the end of their lives. It is given as the foundation of family life in which children are born and nurtured and in which each member of the family, in good times and in bad, may find strength, companionship and comfort, and grow to maturity in love. The Church of England has made it easier to get married in the church of your choice, even if you do not live in that parish. Please see the Church of England’s weddings website for further details, with answers to lots of questions, and some ideas for readings and music. Christian funerals are public opportunities for people to come together to remember and to give thanks for the one who has died, to share in their grief, and to commit the departed to God’s keeping. Services at St. Lawrence can be funeral services with the coffin in the church, or memorial services after a burial or cremation. The churchyard at St. Lawrence is closed for burials, but ashes can still be interred in the garden of remembrance. Burials take place in Lechlade cemetery by arrangement with the Town Council. Anyone who lives in the parish of Lechlade is entitled to a funeral service at St. Lawrence church, but we are also happy to conduct funerals for those with a close connection to Lechlade. From the moment you are in touch with us, throughout the funeral service, and for as long as you need us afterwards, we’re here for you. The Church of England is in every community, and has been helping people mark the end of life for generations. 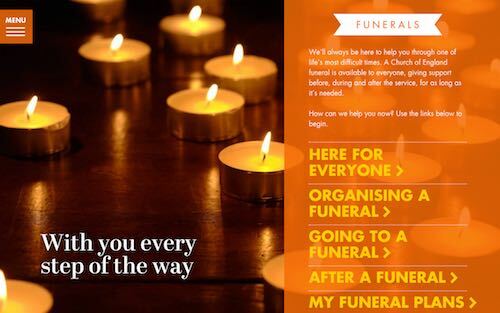 For more details, including a guide to help you plan a funeral, and answers to lots more questions, please see the Church of England’s Funerals website.